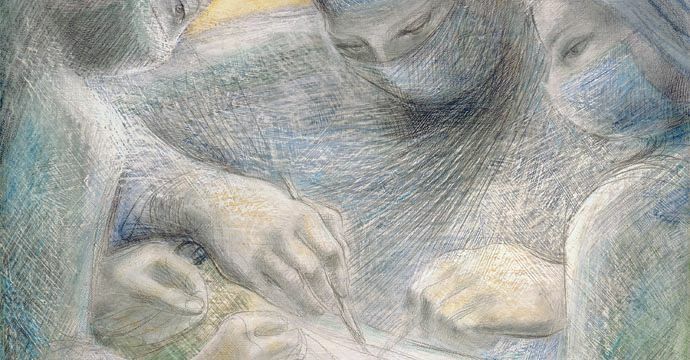 In the late 1940s Barbara Hepworth produced a group of drawings and paintings of surgeons at work in an operating theatre. These detailed figurative works differ strikingly from the abstract sculptures for which Hepworth is best known. Although Hepworth initially responded with horror at the idea of finding any beauty in a hospital theatre, she instead found a beauty and rhythm of work which she found greatly inspiring. This is a Mascalls Gallery touring exhibition which finishes the tour in Kent after appearing at The Hepworth Wakefield and Pallant House Gallery. The Hepworth Wakefield 27 October - 3 Febuary 2013 Pallant House, Chichester 16 Febuary - 2 June 2013 Mascalls Gallery 14 June - 24 August 2013 A fully illustrated catalogue with a detailed account of these works written by Curator Nathaniel Hepburn is available to buy from Mascalls Gallery at £16.99. Published by Tate.